This challenge was inspired by my lovely cousin @BridestockBride. A while back, she made this very soup and it was the accompanying blog post that sold me on the idea of trying something different every day for a year. 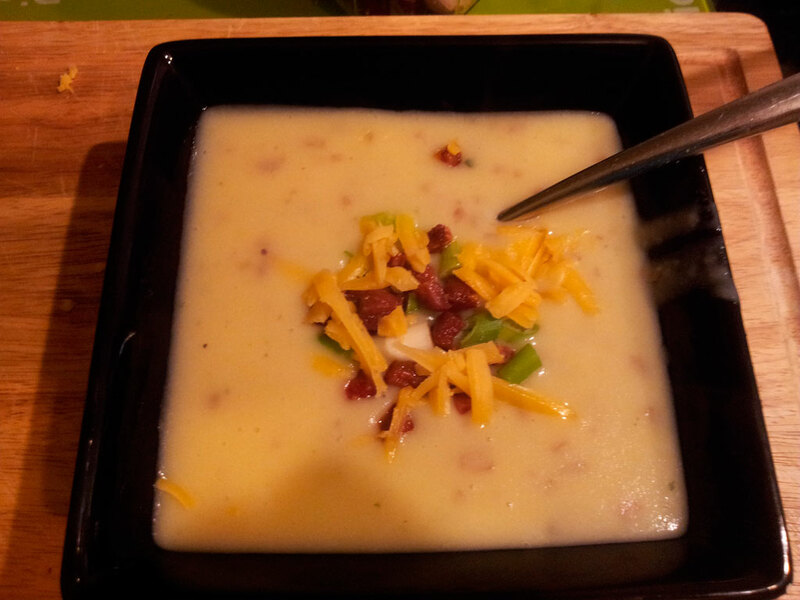 Having bought a huge bag of red potatoes several weeks back to make the soup, I finally got round to it tonight and I must say it was worth the wait and that I should've made it sooner. It's a really filling, comforting winter-worthy soup and if you're a skinny-minnie, you can load it up with all kinds of goodies, but equally, the lower fat version that I made works just as well. I'm supposed to be doing the eat-less-exercise-more thing between now and Christmas. I made a good start yesterday and was going strong until at 7.25am, one of my colleagues presented me with a homemade brownie his young son had made. Now nobody apart from my mum ever gives me homemade cake (this is an issue that needs addressing!!). So I felt I couldn't refuse the offer. Doubly so when I discovered that he'd bought in a box of out-of-date Mr Kipling apple pies to share with the rest of the team. The brownie was much enjoyed with an afternoon cuppa (see I have SOME willpower) and I think that in the name of nurturing the aspirations of a young boy, I had no other option than to give it my full undivided attention. Of course, that put paid to my plan to make the original version of this soup. The one that requires handfuls of cheese. And of course, despite him refusing to even go near this soup 'it smells', I would've made the husband put his handfuls of cheese in rather than my own. When arriving home, any notion of using cheese was scuppered anyway as the husband had used the entire weeks-worth of cheese - aside from a token dairylea-sized piece - to make himself a sandwich. So I used skimmed milk and half-fat creme fraiche to reduce the calorie count. Cheese was omitted from the actual soup and I scattered just a teeny bit on top along with some chorizo rather than bacon (no health reason behind this - just had some leftover in the fridge). I can definitely see how this would benefit from copious amounts of cheese - what savoury recipe wouldn't? But it was nearly as tasty without. Also liked the top-tip about why you should only put pepper in at the end - 'the flavour of pepper evaporates the longer it's cooked' - so I've learnt something new today as well.